Why is Parylene used for waterproofing circuit boards? Parylene is a completely homogeneous coating. That means it is the same thickness all over the circuit. This is achieved by the coating being applied as a vapour and the coating condensing onto the circuit board uniformly. This uniformity of coating means that the water cannot easily come into contact with the circuit and cause shorts. SCH provides Parylene Machines from Paratronix. SCH also offer Conformal Coating Materials, Equipment, Services, Training and Consultancy. When selecting a conformal coating process it is important to ask the right questions. What is the size of the Printed Circuit Board (PCB) you wish to coat? What is the typical volume of the PCBs you want to coat per day, week, month etc? Is there any masking required on the PCBs? Do you know how you would like to hold the PCBs or do you need help with fixture design etc? Is the PCB to be dipped vertically, horizontally or at another angle? What is the material you wish to use for coating the PCB? Is the material compatible with a dip coating process? Do you require a batch process (operator loads and unloads at same point) or an inline process (load one end and take off at another station)? Do you require any curing mechanism within the machine (heat cure, UV light)? Do you require any automated control processes such as viscosity material maintenance and automatic material top up? Asking these questions ensures that a dip coating machine supplier can provide a detailed quotation on the exact machine you need for your project. 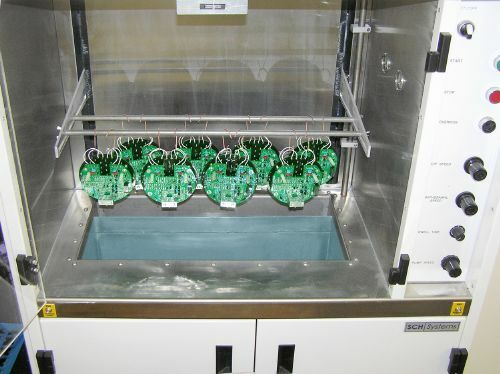 Dip coating is the simplest and highest volume conformal coating process to be used. If printed circuit boards are designed for dip coating the huge savings in money, time and effort can be made. For help on design rules for dipping contact us direct.